The thyroid is a gland in the lower part of the neck that releases hormones which regulate the body’s metabolism. Sometimes lumps, called nodules, form in the thyroid. Thyroid nodules can be either solid, cystic or a mixture of both. Purely cystic nodules are usually made up of blood or colloid (the protein material which holds the thyroid hormone). Purely cystic nodules have almost no chance of having cancer; however, solid or complex (cystic and solid), may have an increased risk of cancer. Not all thyroid nodules are cancerous, and most thyroid cancers are not fatal. In fact, only 1 in 20 thyroid nodules becomes cancerous. However, there are a few different types of thyroid cancer that are dangerous, including medullary thyroid cancer, poorly differentiated thyroid cancer and anaplastic thyroid cancer. There are several factors that determine whether or not a patient is at risk for thyroid cancer. For example, if thyroid nodules or thyroid cancer has occurred in a patient’s family, he or she is more likely to develop such problems as well. Women are also more likely to develop thyroid cancer than men—three times more likely, in fact. Additionally, women are more likely to be diagnosed earlier in life—usually in their 40s and 50s. Men, on the other hand, are more often diagnosed in their 60s and 70s. Fine needle aspiration (FNA) is the standard of care in order to diagnose whether a thyroid nodule is benign or malignant. It is also the quickest and least invasive way to diagnose thyroid cancer. FNA uses a very thin needle to extract tissue from the thyroid to be examined in a lab. An FNA of the thyroid can be performed in an outpatient setting, making the process easier and more convenient for the patient. There is usually no major preparation required the night before the procedure. Although, you may be asked to stop taking medications that would thin your blood (i.e. aspirin or ibuprofen) a few days prior to the procedure. 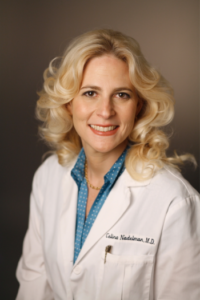 When you arrive at Dr. Nadelman’s office, you will be shown to a treatment room where Dr. Nadelman will take a focused history and physical exam. She and the sonographer will identify the area of concern using an ultrasound, and they will note the nodule’s imaging characteristics, such as location and size. After consenting you, your skin will be prepared and cleansed with an antiseptic. The spot where the biopsy will take place will also be marked. If you are not allergic, a local anesthetic, such as Lidocaine, will be injected superficially over the lump to numb the tissue. The FNA process is quick and relatively painless. The needle used for an FNA biopsy is extremely thin, and the doctor inserts the needle into the area being tested and removes a small core of cells. The cells are then ejected from the needle onto a glass slide, smeared, and fixed. Since Dr. Nadelman has a microscope in the same procedure room and is a cytopathologist with an on-site laboratory, she can examine the slide to make sure there is enough tissue to make a diagnosis. This helps to prevent repeat visits for more biopsies. In addition, since she is a pathologist, she also can take more tissue if needed for other tests, such as molecular testing. Due to Dr. Nadelman’s on-site laboratory and her unique process of using a microscope in the procedure room to ensure enough tissue is taken, the biopsy results are often available very quickly after the procedure—sometimes within 48 hours. This process allows the patients to not only receive the fastest results, but also the most accurate results. Finally, since an FNA biopsy is a minimally invasive procedure, you should be able to return to your normal routine soon. If the area does become sore, ice or over-the-counter medication, such as acetaminophen, may be used to alleviate discomfort.